A hallmark of diseases of protein conformation and aging is the appearance of protein aggregates associated with cellular toxicity. We posit that the functional properties of the proteostasis network (PN) protect the proteome from misfolding and combat the proteotoxic events leading to cellular pathology. 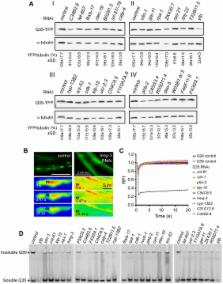 In this study, we have identified new components of the proteostasis network that can suppress aggregation and proteotoxicity, by performing RNA interference (RNAi) genetic screens for multiple unrelated conformationally challenged cytoplasmic proteins expressed in Caenorhabditis elegans. We identified 88 suppressors of polyglutamine (polyQ) aggregation, of which 63 modifiers also suppressed aggregation of mutant SOD1G93A. Of these, only 23 gene-modifiers suppressed aggregation and restored animal motility, revealing that aggregation and toxicity can be genetically uncoupled. Nine of these modifiers were shown to be effective in restoring the folding and function of multiple endogenous temperature-sensitive (TS) mutant proteins, of which five improved folding in a HSF-1–dependent manner, by inducing cytoplasmic chaperones. This triage screening strategy also identified a novel set of PN regulatory components that, by altering metabolic and RNA processing functions, establish alternate cellular environments not generally dependent on stress response activation and that are broadly protective against misfolded and aggregation-prone proteins. A common characteristic of protein conformational diseases is the appearance of protein aggregates associated with late-onset symptoms. Here, we have taken an unbiased genetic approach to test the hypothesis that protein aggregation and toxicity are co-linked genetic traits that are regulated by a common proteostasis network. To address this, we took advantage of the tractable genetic model Caenorhabditis elegans expressing expanded polyglutamines (polyQ) and performed a genome-wide RNA interference (RNAi) screen to identify genes that altered the proteostasis environment and suppressed aggregation and toxicity. These modifiers were subsequently tested on animals expressing mutant SOD1 and on animals expressing endogenous proteins with temperature-sensitive mutations. This screening triage resulted in the identification of nine genes with effects on protein folding, corresponding to new proteostasis pathways involved in metabolism and RNA processing functions. Methods are described for the isolation, complementation and mapping of mutants of Caenorhabditis elegans, a small free-living nematode worm. About 300 EMS-induced mutants affecting behavior and morphology have been characterized and about one hundred genes have been defined. Mutations in 77 of these alter the movement of the animal. Estimates of the induced mutation frequency of both the visible mutants and X chromosome lethals suggests that, just as in Drosophila, the genetic units in C. elegans are large. A principal challenge currently facing biologists is how to connect the complete DNA sequence of an organism to its development and behaviour. Large-scale targeted-deletions have been successful in defining gene functions in the single-celled yeast Saccharomyces cerevisiae, but comparable analyses have yet to be performed in an animal. Here we describe the use of RNA interference to inhibit the function of approximately 86% of the 19,427 predicted genes of C. elegans. We identified mutant phenotypes for 1,722 genes, about two-thirds of which were not previously associated with a phenotype. We find that genes of similar functions are clustered in distinct, multi-megabase regions of individual chromosomes; genes in these regions tend to share transcriptional profiles. Our resulting data set and reusable RNAi library of 16,757 bacterial clones will facilitate systematic analyses of the connections among gene sequence, chromosomal location and gene function in C. elegans. Adapting proteostasis for disease intervention. The protein components of eukaryotic cells face acute and chronic challenges to their integrity. Eukaryotic protein homeostasis, or proteostasis, enables healthy cell and organismal development and aging and protects against disease. Here, we describe the proteostasis network, a set of interacting activities that maintain the health of proteome and the organism. Deficiencies in proteostasis lead to many metabolic, oncological, neurodegenerative, and cardiovascular disorders. Small-molecule or biological proteostasis regulators that manipulate the concentration, conformation, quaternary structure, and/or the location of protein(s) have the potential to ameliorate some of the most challenging diseases of our era. Conceived and designed the experiments: MCS RIM. Performed the experiments: MCS SF MB HT. Analyzed the data: MCS MB HT RIM. Wrote the paper: MCS MDA RIM. Copyright statement: Silva et al. This is an open-access article distributed under the terms of the Creative Commons Attribution License, which permits unrestricted use, distribution, and reproduction in any medium, provided the original author and source are credited.